Goettingen Handel Festival: Orlando | The New York Baroque Dance Co.
Catherine Turocy stage directed Handel’s opera. ORLANDO, for the Goettingen Handel Festival in Germany. With sold out houses and unending applause, this production may have future appearances in Europe. We will keep you informed! 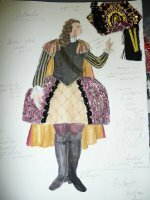 Bonnie Kruger is the costume designer and this is one of her sketches for the production. The talented Nicholas McGegan conducted the Festival Orchestra of Goettingen (FOG) in this dramatic interpretation with William Towers as the mad Orlando, Dominique Labelle as the fickle Angelika, Susanne Ryden as the comic Dorinda, Diana Moore as the young Medoro and Wolf Matthias Friederich as the powerful Zoroastro. Sarah Edgar was the sharp-eyed assistant to the stage director as well as a dancer, playing the genie of air and water and the shadow of Persephone. She was joined by the fiery Caroline Copeland who also portrayed a quivering Princess Isabella, and Alan Jones and Jason Melms who spent the whole opera in remarkable Fire Salamander masks designed by Jane Stein. Our trusty production assistant who never missed a beat was Leonie Wener. Of course we could not be a success without our supers who played Cupid (Christian Hauke Poensgen) and the lovers (Franziska Poensgen, Selen Erdogmus, Marc Duck and Florian Hallaschka). Scott Blake designed the wonderful sets and Pierre Dupouey transformed the stage with his lighting design. The last performance ( of 6 ) is this coming Monday, May 12th. So if you are in Germany, fly to Goettingen on a dragon to catch this unusual production! This is wonderful! Would love to see the production in New York. Any chance?